Gonzalo Frasca here comments on the so-called ‘ludology vs. narratology debate’ that was helpful in clarifying the core agenda of ludology (as critical game studies), while noticing how the most extreme oppositional positions in this debate appeared to be based on misunderstandings. This is the article that is one of the key documents for establishment of ‘ludology’ as a ‘discipline that studies game and play activities’. 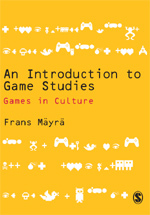 The early ludology was particularly defined by its counter-reaction against narratology (or rather any ‘narrativizing’ of games), later game studies have adopted much of ludology’s key agenda.